Who said more is better? 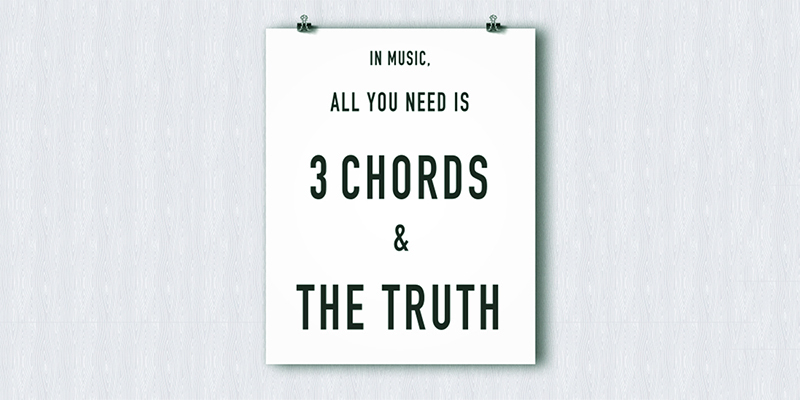 Our team of musicians compiled a list of their favourite 3-chord songs to play. If you're looking for some new crowd-pleasers, you'll want to check out these simple-but-classic 3-chord masterpieces. We'd also love to hear your favourite 3-chord songs, leave them in the comments and we'll add them to this list! "Lead single from the ambitious Rattle & Hum album ("it's a musical journey"), "Desire" is a three-chord belter to rattle the pipes and get that rhythm hand warmed up. The quiet / loud aesthetic makes you wonder if they'd been listening to the Pixies when making the album. It's also an example of Bono's magpie tendency with titles, lifting here from Dylan, who also featured on the album. Altogether, now: "Burning, burning..."" - Will C.
"Sally Cinnamon" was The Stone Roses' second single, pre-dating their epochal eponymous debut by a year. Though John Squire's style is usually more lead than rhythm, this sounds great on acoustic with just D, G and C, especially if you spend a little time on learning the lead riff." - Will C.
"Originally written by Richard Berry in 1955, ‘Louie, Louie’ has been covered by artists from The Grateful Dead to Motörhead, but it’s the 1963 version by The Kingsmen that is instantly recognisable. There are few three-chord songs out there that have had such a big influence in pop and rock music and the song continues to appear on movie soundtracks even today." - Sam H.
"Sampling two hit songs from the 1970s - Warren Zevon’s “Werewolves of London” and Lynyrd Skynyrd’s “Sweet Home Alabama” - this song is always a crowd favorite!" - Becca P.
"Released in January 2000 and selected by Rolling Stone as one of the “100 Greatest Pop Songs,” this song’s music video was a major success on MTV’s Total Request Live (TRL). If your audience has people in their late 20's and early 30's, this will be a hit!" - Becca P.
"Composed in 1946 by American songwriter Bobby Troup, this song uses a 12-bar blues arrangement and the lyrics follow the path of U.S. Route 66, which traversed the western two-thirds of the U.S from Chicago, IL to Los Angeles, CA. Recorded by artists from Nat King Cole to the Rolling Stones, to Depeche Mode and John Mayer, this is a must-have standard for every musician!" - Chris K.
"Cash allegedly had a dream where he heard "Ring of Fire" (originally recorded by Anita Carter) accompanied by mariachi horns. His version landed at #1 in 1963 and was entered into the Grammy Hall of Fame in 1999. Even if you don't have a horn section, this song is certain to get people of all ages singing along!" - Isaac C.